Ahmedabad: Like his mentor Narendra Modi, Bharatiya Janata Party chief Amit Shah goes for his targets like a rhino and is seldom known to cajole rivals or even supporters to get things done. More so in Gujarat, where anything goes in the name of the BJP. The big news however, is that this may no longer be so. This man and his party got a shock on Thursday evening in of all places Surat – the state’s diamond capital where money and support has long flown for the BJP like the Tapi. This time round, however, Shah and his colleagues were greeted with slogans such as ‘General Dyer Go Back’ – a reference to the murderous British commander at Jallianwalla Bagh. 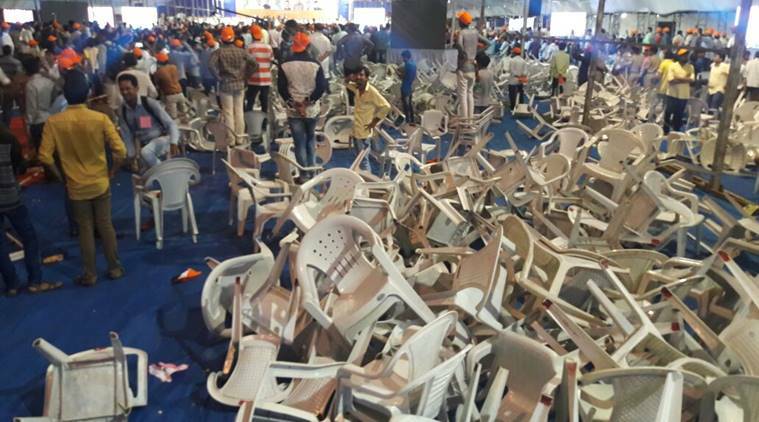 As plastic chairs were thrown in the air, the BJP leaders were forced to beat a hasty and embarrassed retreat. To recap, this was billed as a grand event to showcase to the band of agitating young Patel toughs who have virtually held the BJP government to ransom for a year, that a major part of their community had returned to the BJP. Organised by the Surat Samasta Patidar Abhivadan Samiti – a group of big-time real estate and diamond lords from the powerful Patel community based in the city – this was supposed to be a tactical offensive by Amit Shah on Hardik Patel and his Patidar Anamat Andolan Samiti (PAAS) that has spearheaded the demand for reservation for Patels. But the grand event, which was intended to demonstrate that at least one lakh Patidars stood firm with the BJP, witnessed ugly scenes in the presence of a galaxy of BJP leaders like Amit Shah, his appointees like the new chief minister, Vijay Rupani, and state party president Jitubhai Vaghani, his bête noire, the former chief minister Anandiben Patel and powerful Patel leader and Union minister of state for agriculture Parshottam Rupala. Protestors resorted to relentless slogan-shouting and tossed chairs in the air at the specially erected dome at the sprawling PP Savani Ground in Abrama area, forcing speakers to cut short their speeches. Chants such as ‘Jai Sardar’, ‘Jai Patidar’ and ‘Jai Hardik’ drowned out Amit Shah, who was declaring that the Patels, the BJP and Gujarat had grown hand in hand. Besides Shah, a shaken Vaghani – who said “Patels don’t behave like this” – and Rupani had to wrap up their speeches within three to five minutes all told. When Rupani promised the audience his government would work for the Patidar community and protect them in villages in Saurashtra, there was hardly anybody left to listen to him. The agitated crowds left with saffron caps and flags strewn all around the place. An angry Shah and his team ordered dozens of Patidar youngsters arrested at the end of the day. The irony was complete 24 hours later when a former diamond baron and now real estate tycoon from the Patel community Maheshbhai Savani of the PP Savani Group, who was the key organiser of the event along with another real estate developer Mukesh Patel, wrote a letter requesting chief minister Vijay Rupani to set free the 135 arrested Patidar protestors without initiating any legal action against them. The entire episode is a huge setback to the BJP not only because the Patidars demonstrated to the party that they were still very much in agitation mode, but also because the party for over a month has been trying to engineer a split between Hardik Patel and his PAAS leaders and has even allegedly been trying to fix them in criminal cases. Hardik Patel, who is at present in exile in Rajasthan on the orders of the Gujarat High Court, penned a strong letter to Rupani last week accusing him and his party of using dirty tricks against the Patidar agitators. “Either you or your BJP are trying to frame our leaders in false criminal cases as well as to drive a wedge between them in a sinister attempt to break the agitation,” he wrote. He alleged that PAAS’s Mahisagar district convenor, Virendra Patel, had been framed and jailed in an arms case by controversial police officer N.K. Amin, himself allegedly involved in the Ishrat Jahan encounter case, “just to terrorise our youngsters.” Hardik was referring to a case of discovery of arms from the personal vehicle of Virendra Patel and alleged that Amin, who is the DSP of Mahisagar district, had falsely implicated him. At the same time, close aides of Hardik have also been quitting the PAAS. One of his close supporters, Nikhil Sawani, quit the organisation in protest against what he claimed was the increasingly “autocratic and politically motivated” style of functioning of the firebrand leader. Sawani denies it, but a PAAS spokesman claimed he had been forced to resign while Hardik called it a “political ploy” of the BJP. Sawani had played a key role during the quota stir last year in Surat and elsewhere and participated in the long drawn-out fast demanding the release of Hardik Patel from jail. His resignation came as a surprise since Sawani was recently appointed convenor of Vadodara, Bharuch and Narmada districts, besides already holding the fort at Surat, and had also been nominated on a dedicated panel to represent PAAS in TV discussions and public programmes. Sawani’s move came on the heels of three close aides of Hardik snapping ties claiming financial malfeasance. Key supporters Chirag Patel and Ketan had alleged that Hardik was misusing the funds collected in the name of the agitation for his ‘luxurious’ lifestyle. The two were later suspended from PAAS. Meanwhile, a PAAS leader from Morbi in Saurashtra, Nilesh Ervadiya, who was the first to be booked under sedition charges during the quota stir, also alleged that Hardik was going wayward and the agitation was losing direction. He claimed that Hardik was being misled by certain political leaders. But all this is no consolation for Shah and his party, since it is clear that the Patels, with or without Hardik, are a dissatisfied lot. If their grievances are not addressed, the BJP could be in trouble in the forthcoming state elections in 2017.